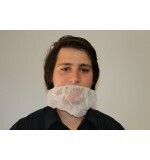 Ensure a neat and clean working environment with sturdy, beard nets. Full-coverage protection meets the needs of healthcare, lab and food prep professionals. FDA compliant. 100 per bag, 10 bags per case. ..